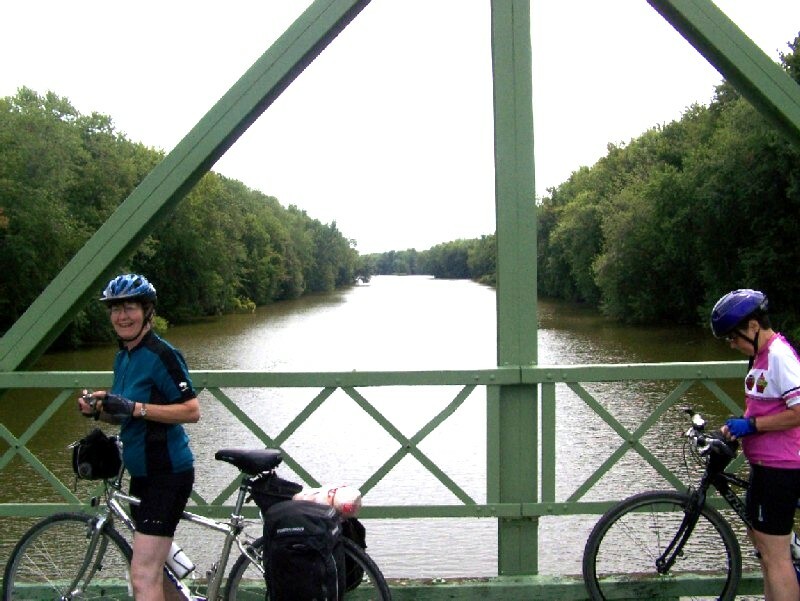 The next segment of our journey between Newark and Syracuse took to the road because the Erie Canal Heritage Trail came to an end. 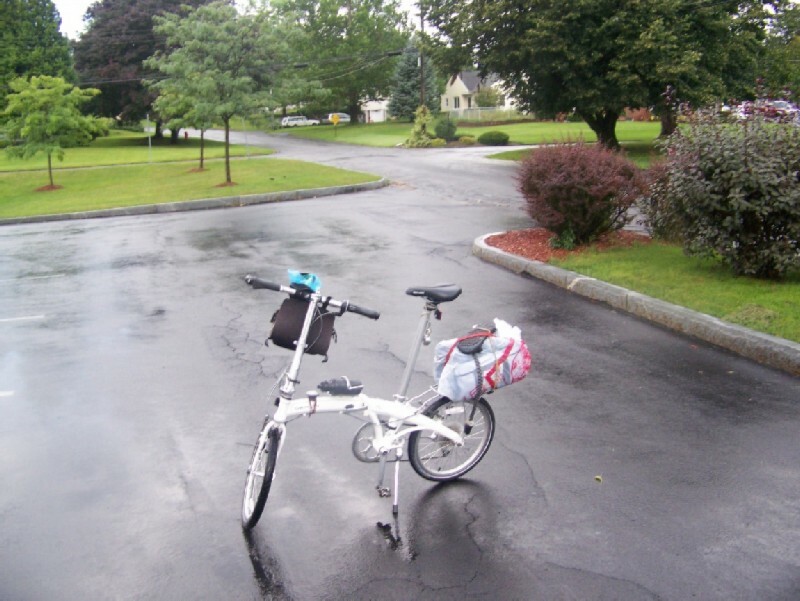 We could have used Bike Route 5, which stays fairly close to the canal until just before Syracuse. However, the best I could do for lodging using the internet was way over $100. Two days in a row of that was too much. Besides, there were reports that the path between Port Byron and just west of Syracuse was rough gravel. So I looked for another route and settled on a detour to Auburn before returning to the Canal at Dewitt, just east of Syracuse. Originally, I planned to use back roads between Newark and Lyons. 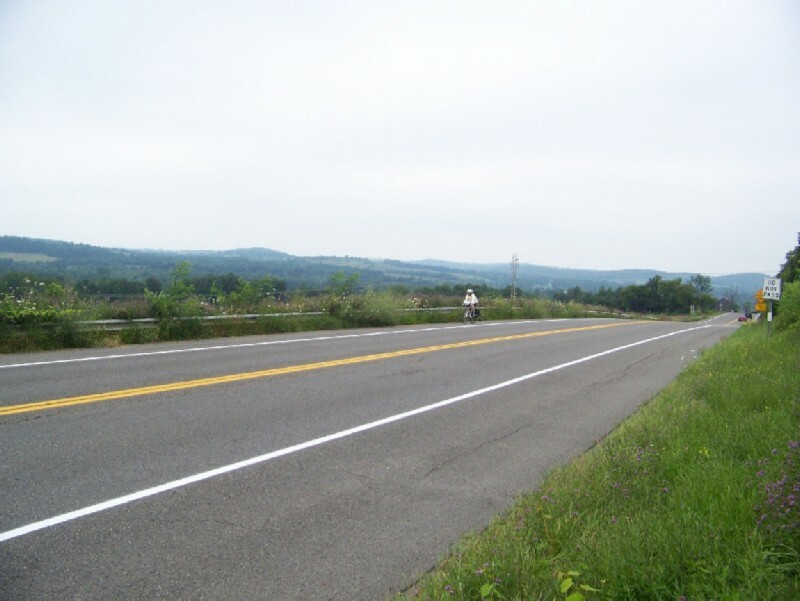 But we stayed on NY 31 (Bike route 5) because there was a shoulder and traffic was not too heavy. Our route can be found here. 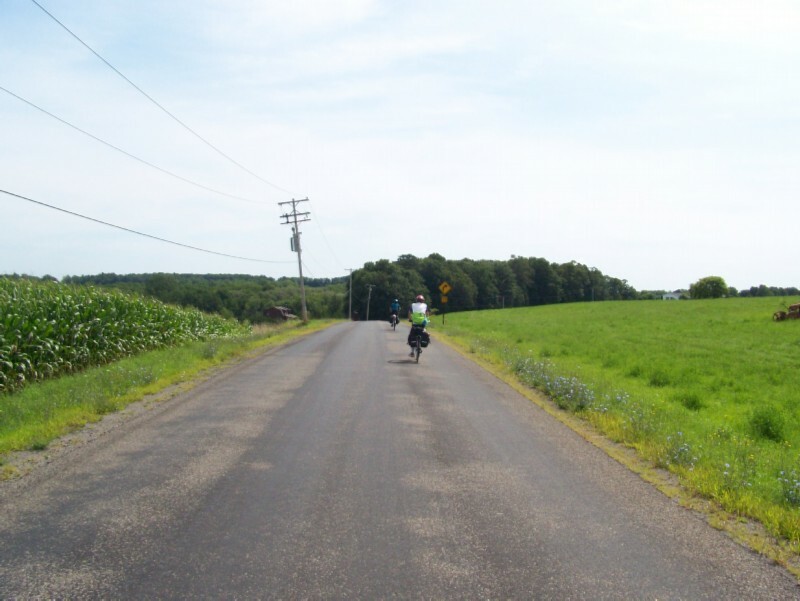 It was on Route 31 that we saw the last two through riders going in the opposite direction. As we approached Lyons on Route 31, I saw a motel on the left hand side called, I believe, Erie Canal Inn, that looked pretty decent. It was not listed by Google. On the other hand we found Motel Wayne, which Google did know about, but seemed to be out of business or turned into apartments. With better information, our route may have been different. WEATHER: mid to upper 70's, more humid, mostly cloudy, thunderstorms predicted; but we never got wet. 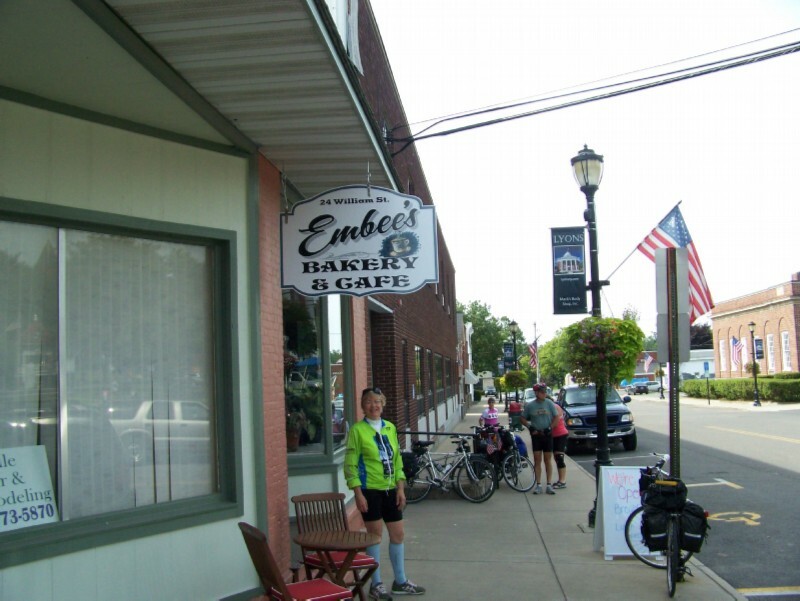 Embee's Bakery and Cafe, Lyons. Since there was no complimentary breakfast at the Quality Inn, we stopped for breakfast in Lyons. The food was good; but the service was excruciatingly slow. Apparently, they had just opened up for business. Downtown Lyons. This was more like the typical American small town with empty storefronts. Farm country southwest of Lyons. At first our route was fairly flat. Then it became rolling hills. Resting in the small village of Marengo. 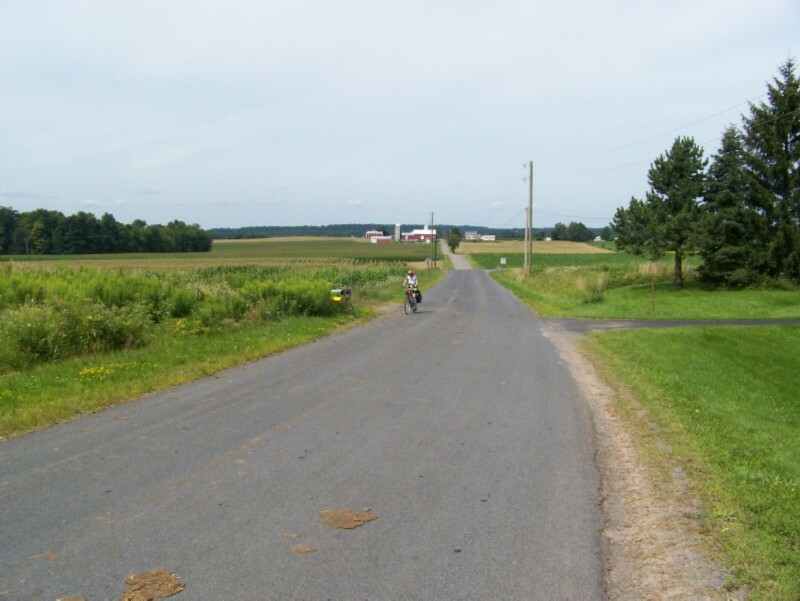 About 2 miles east of here, between Jenkins Road and NYS 414, Turnpike Road turned into rough gravel for about 1/4 mile. This was the only time that Google Maps failed us. Cresting a hill in front of an attractive stone farm house. After descending a long steep hill to the junction with Route 31, and then passing bottom land corn fields worthy of Illinois or Iowa, we crossed the canal. No yacht harbors here. 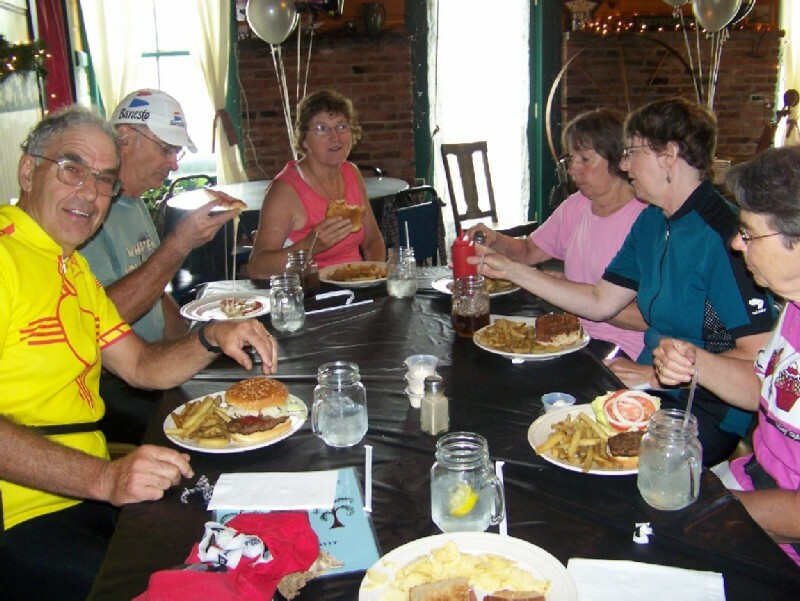 Country House Restaurant in an historic building in Montezuma. This was the only food establishment between Lyons and Auburn. Google had listed another restaurant; but it was out of business. For all it power, Google can be dumb sometimes. We barely arrived in time to get served because they were closing at 2:00 for a private party. Food was good. The last 10 miles was even hillier. Dilaj Motor Inn. 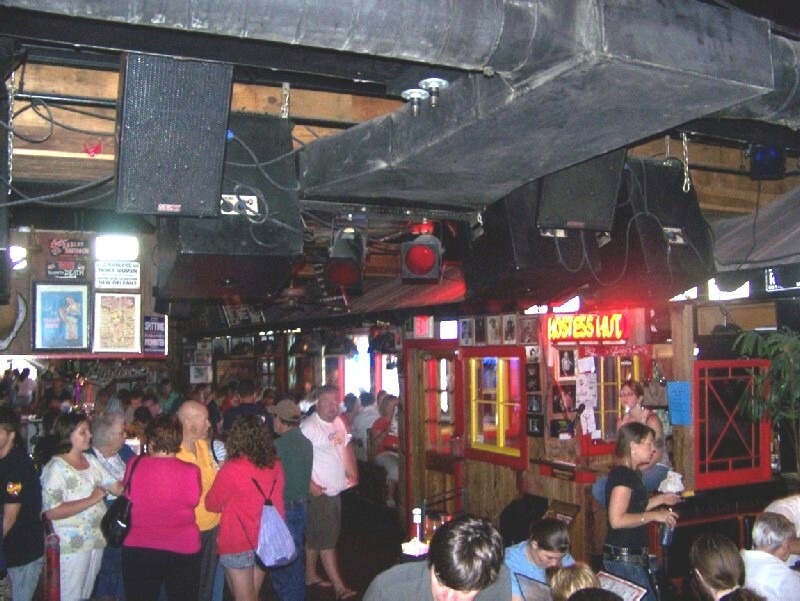 There is an interesting bar to the right on the first floor, plus a picnic table under the tree for the smokers. What can I say. It lacked amenities one comes to expect; and it did not meet Jeanine's standard of cleanliness. On the other hand, the shower was hot, the bed was comfortable, it was quiet, and it had a microwave and refrigerator. Also when, the proprietor found out my brother had lost his wallet (10 miles back at the Country House Restaurant in Montezuma, he thought) he drove him back to the restaurant to look for it. I rode the two miles into town and then went looking for Walmart to purchase something to heat in the microwave for supper. By the time I found it and made my way back in a round about way, I had earned 10 bonus miles. 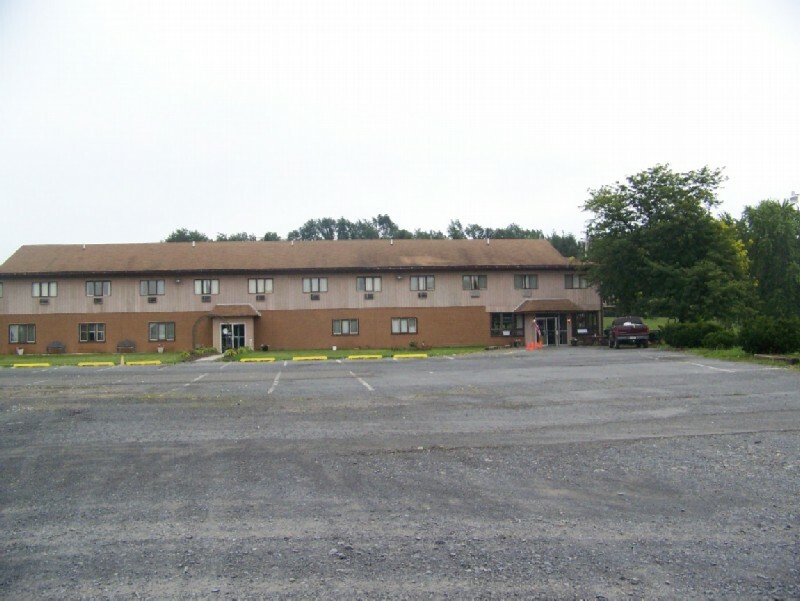 August 9 - Auburn to Syracuse (Dewitt); MILEAGE 28; Lodging Econolodge, Dewitt. Two miles after turning north onto NYS 5, we came upon a gas statoin/convenience store where the caffeine addicts could get their wake-up coffee. The motel had no coffee, nor cups to heat water to make our own. 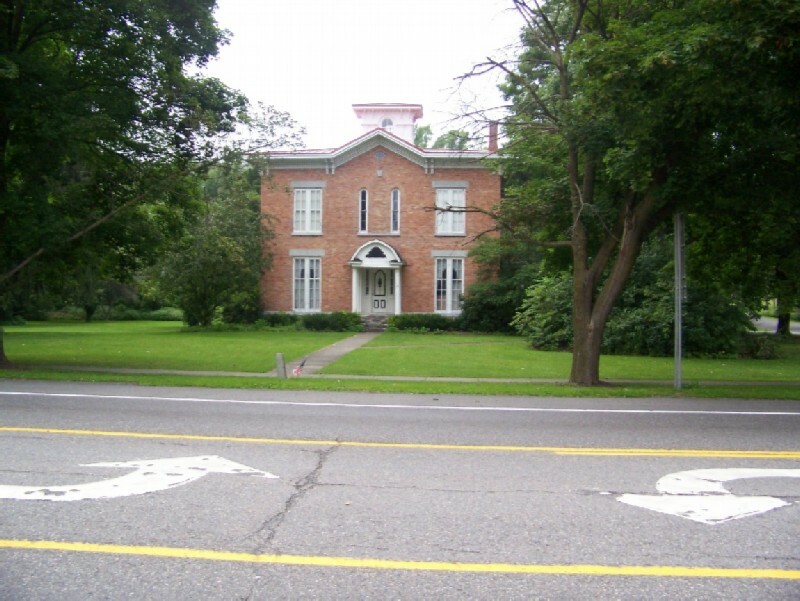 Elbridge consisted of a series of stately Italianate homes on the main street and then strip malls on the eastern side of town. 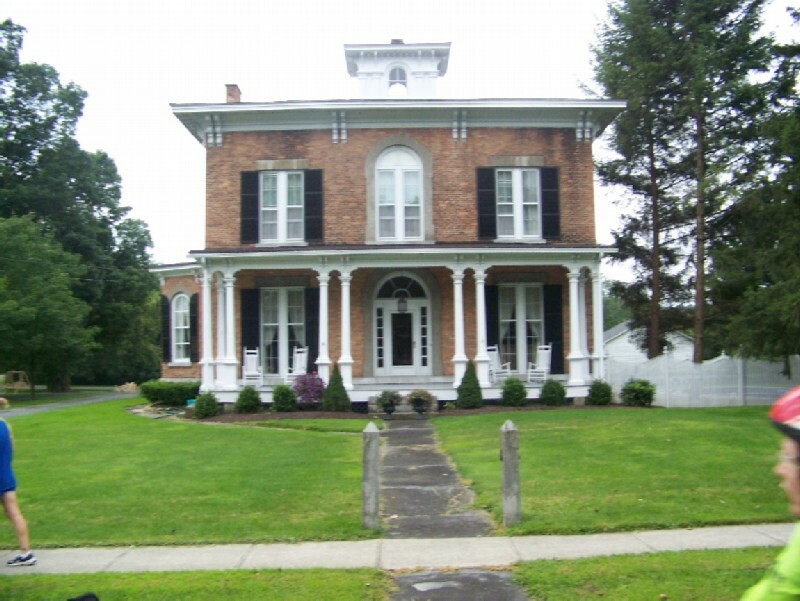 Another Italianate gem in Elbridge. 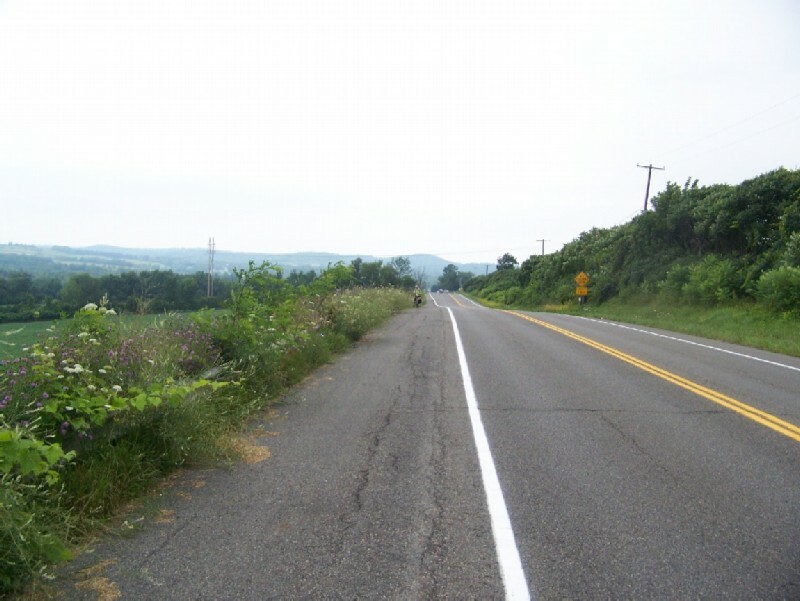 Marcia coming up a long hill between Elbridge and Camillus. Jeanine coming up the same hill somewhat later. Since it was Sunday, we were were looking for a church that we'd been told was at the top of a very steep hill coming out of downtown Camillus. After the hill we needed the physical and spiritual rest. 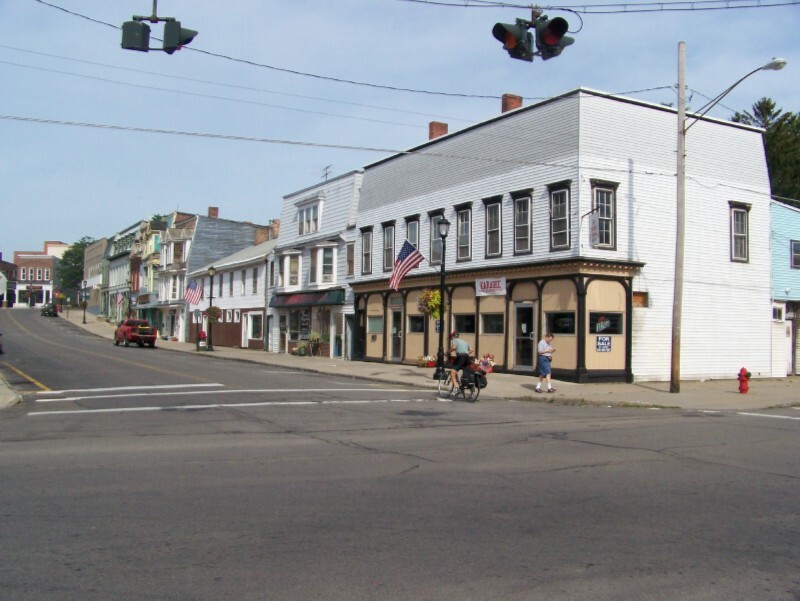 From here until the Syracuse city limits, it was the typical ugly "road town", McD's, Bull-mart, and all the rest. But a shoulder did make it ridable. At the city limits, it became more residential and pleasant. Dinosaurs Bar-B-Q restaurant. I had mentioned that we may be passing close to a famous bar-b-Q joint. 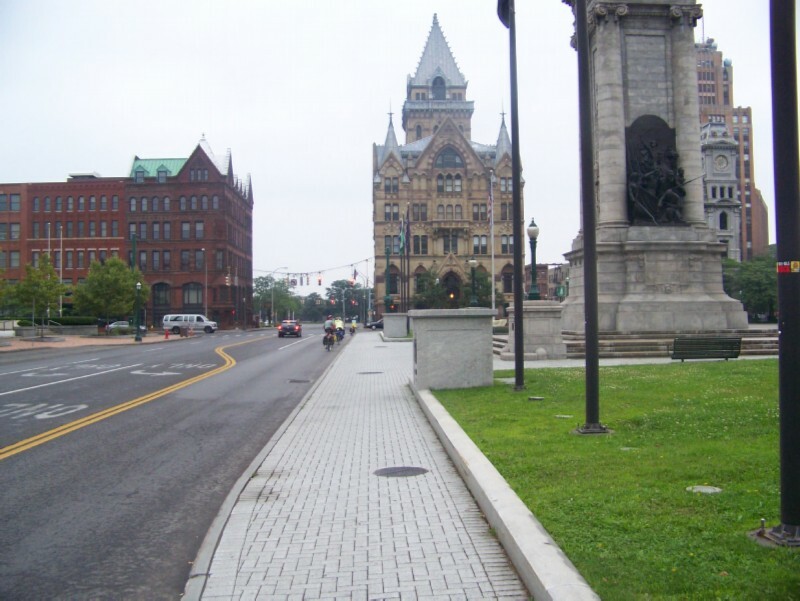 As we approached downtown Syracuse on Route 5 (Genesee Street), I spotted it only a half block away. As my brother commented when we had finished eating, "it would have been worth it to go out of the way for". Downtown Syracuse on a Sunday afternoon. Parking lot of the Dewitt Econolodge. The front of the motel faced the typical "franchise alley", whereas the side and back was set in a residential neighborhood. 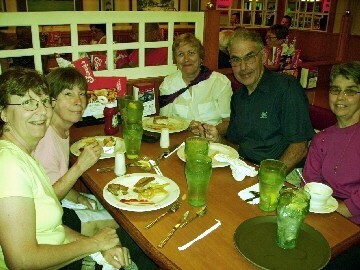 Friendly's Restaurant, Dewitt. Their very reasonable senior citizen menu included 2 scoop sundaes for dessert. We took advantage of that for 3 evening meals: Lockport, Dewitt, and Utica.